We supply a wide range of fencing materials for agricultural and garden fences. Most of our fencing supply is made from pressure treated softwood. However, fencing can also be supplied in larch and oak which are naturally durable outdoors. We have a range of pressure treated softwood posts, boards and rails in stock. Alternatively, we can produce fencing timber from untreated or pressure treated larch. 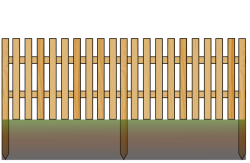 Picket fencing is a classic style of garden fencing. Pointed pickets are attached to two horizontal rails at 3.6m length which in turn are fixed to fence posts. 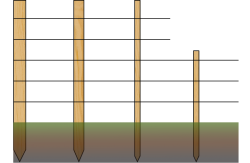 Fence posts should be 60cm deep in the ground and spaced 1.8m apart. Dimension of the picket are 75 x 19mm which we supply in two standard lengths, 900 and 1200mm. 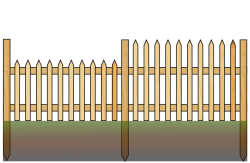 To build a typical picket fence use a loose picket to determine the spacing between pickets. For your total number of pickets, divide you total length by 0.094m (94mm). 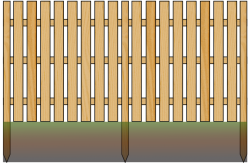 A board fence provides both a barrier and privacy. For a 1.2m high board fence we recommend 1.8m x 100mm x 100mm fence posts at 1.8m spacing. 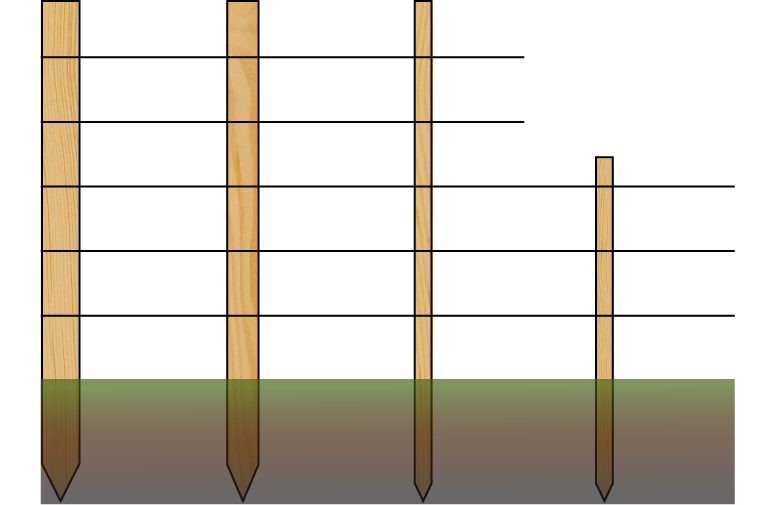 Your posts should sit 60cm deep in the ground. You will need 2 horizontal rails 3.6m x 87 x 32mm per 3.6m length. Boards are 1.2m x 100mm x 19mm. The spacing of your boards can be adapted to your needs. You can place the boards on one side or alternate them from side to side. To determine the number of boards needed for a typical board fence with a 19mm gap between boards divide your total length by 0.119m (119mm). For a 1.8m high board fence we recommend 2.4m x 100mm x 100mm fence posts at 1.8m spacing. Your posts should sit 60cm deep in the ground. You will need 3 horizontal rails per 3.6m length. You can either use 1.8m x 100mm x 19mm boards or slightly wider ones at 1.8m x 150mm x 19mm. 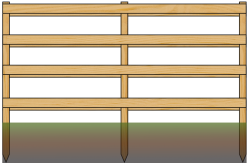 A Ranch type fence provides a simple barrier. We recommend 100 x 100mm fence post at whatever height you require your fence to be. Your post should sit 60cm deep in the ground at 1.8m spacing. To determine the number of posts divide your total length by 1.8 and add one post for the end of the fence. You can place your boards (3.6m x 150mm x 19mm) on the same side or on alternating sides of the fence. To determine the total number of boards needed divide your height by (150mm + your chosen gap). We supply softwood posts for livestock or wire fencing. All posts are made from fully treated softwood for guaranteed durability. You will need a straining post at the start of your fence line and at every change of direction or height, for gateposts, and otherwise every 50m or so. We have two types of straining posts in stock: Heavy duty strainer: 7” x 8′ (180mm x 2.4 m)Typically used at the beginning and end of a stretch of fence wire (250m) or to hold a gate Medium straining post: 6” x 8′ (150mm x 2.4m) We also supply medium size fence posts or ‘stobs‘ for in between straining posts. Our stobs are 75mm x 75mm and come in two standard lengths, 1.65m and 2.4m. Stobs should be 2 to 3.5m (7′-12′) apart and driven 45 – 60cm (1.5 to 2′) into the ground. For timber fencing such as ranch fences or post and rail fencing see our section on Garden fences. We have recently started producing 125mm feather edged fencing in 1.5m, 1.65m and 1.8m lengths. Sawn out of spruce and douglas fir logs these pressure treated boards will make your close board fence look immaculate every time. Please contact us for availability or any custom sizes required.